One stock that's starting to move within range of triggering a near-term breakout trade is 3D Systems (DDD - Get Report), which through its subsidiaries, operates as a provider of 3D printing centric design-to-manufacturing solutions in the U.S., Germany, the Asia-Pacific and other European countries. This stock has been hammered lower by the bears so far in 2014, with shares off sharply by 47%. If you take a look at the chart for 3D Systems, you'll see that this stock has recently come out of a nasty downtrend, that saw shares fall from its 2014 high of $97.28 to its recent low of $43.35 a share. Over the last month and change, shares of DDD have started to trend sideways and consolidate between $43.35 on the downside and around $55 on the upside. This sideways price action could be marking a potential bottom here for shares of DDD if the lower-end of the range can hold as major support. Shares of DDD are now starting to spike higher above its recent lows and it's beginning to move within range of triggering a near-term breakout trade above the upper-end of its recent sideways trading chart pattern. 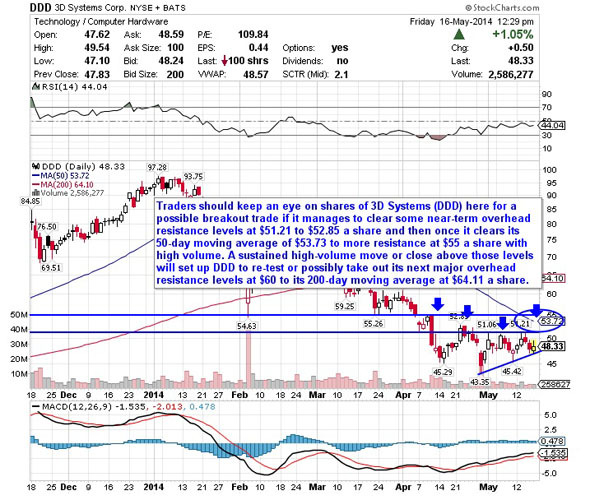 Traders should now look for long-biased trades in DDD if it manages to break out above some near-term overhead resistance levels at $51.21 to $52.85 a share and then once it clears its 50-day moving average of $53.73 to more resistance at $55 a share with high volume. Look for a sustained move or close above those levels with volume that hits near or above its three-month average volume of 4.92 million shares. If that breakout busts out soon, then DDD will set up to re-test or possibly take out its next major overhead resistance levels at $60 to its 200-day moving average at $64.11 a share. Traders can look to buy DDD off weakness to anticipate that breakout and simply use a stop that sits right below some key near-term support levels at $45.42 to $43.35 a share. One can also buy DDD off strength once it starts to clear those breakout levels with volume and then simply use a stop that sits a comfortable percentage from your entry point. A basic materials player that's starting to trend within range of triggering a big breakout trade is North American Palladium (PAL, which produces precious metals in Canada. It explores for palladium, platinum, nickel, copper and other metals. This stock has hit hard by the sellers so far in 2014, with shares down big by 61%. If you take a look at the chart for North American Palladium, you'll see that this stock has been downtrending badly for the last month and change, with shares moving lower from its high of 60 cents per share to its recent low of 23 cents per share. During that downtrend, shares of PAL have been making mostly lower highs and lower lows, which is bearish technical price action. That said, shares of PAL have now started to stabilize a bit around 23 to 26 cents per share. Shares of PAL are now spiking higher today and this stock is quickly moving within range of triggering a big breakout trade. 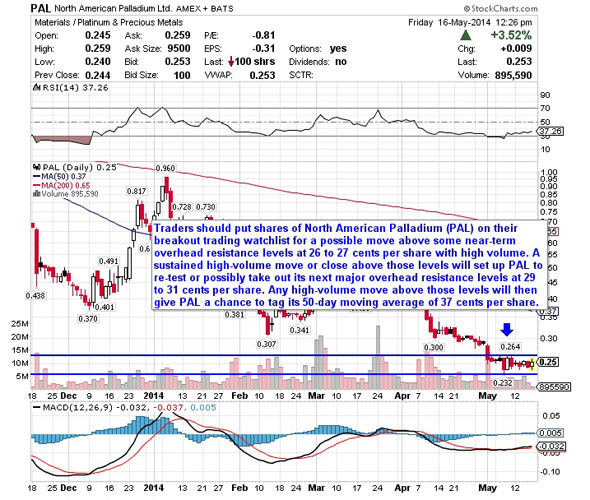 Traders should now look for long-biased trades in PAL if it manages to break out above some near-term overhead resistance levels at 26 to 27 cents per share with high volume. Look for a sustained move or close above those levels with volume that hits near or above its three-month average action of 6.34 million shares. If that breakout hits soon, then PAL will set up to re-test or possibly take out its next major overhead resistance levels at 29 to 31 cents per share. Any high-volume move above those levels will then give PAL a chance to tag its 50-day moving average of 37 cents per share. Traders can look to buy PAL off weakness to anticipate that breakout and simply use a stop that sits right below its 52-week low of 23 cents per share. One could also buy PAL off strength once it starts to take out those breakout levels with volume and then simply use a stop that sits a comfortable percentage from your entry point. 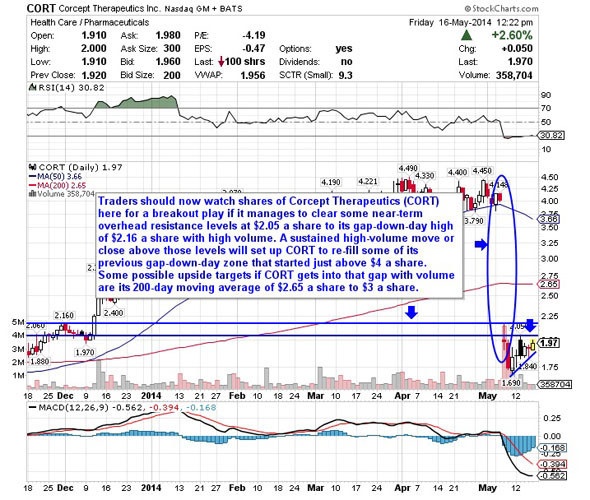 Another stock that's starting to move within range of triggering a big breakout trade is Corcept Therapeutics (CORT - Get Report), which is engaged in the discovery, development and commercialization of drugs for the treatment of metabolic, psychiatric and oncologic disorders in the U.S. This stock has been hit hard by the sellers so far in 2014, with shares off sharply by 38%. If you take a glance at the chart for Corcept Therapeutics, you'll notice that this stock gapped down sharply a few weeks ago from over $4 to under $2 with monster downside volume. Following that move, shares of CORT went on to make a new low at $1.69 a share, which happens to sit right above its 52-week low of $1.47 a share. This stock has now started to rebound off that $1.69 low and it's quickly moving within range of triggering a big breakout trade above some key near-term overhead resistance levels. Traders should now look for long-biased trades in CORT if it manages to break out above some near-term overhead resistance levels at $2.05 a share to its gap-down-day high of $2.16 a share with high volume. Watch for a sustained move or close above those levels with volume that hits near or above its three-month average action of 683,200 shares. If that breakout materializes soon, then CORT will set up to re-fill some of its previous gap-down-day zone that started just above $4 a share. Some possible upside targets if CORT gets into that gap with volume are its 200-day moving average of $2.65 a share to $3 a share. Traders can look to buy CORT off weakness to anticipate that breakout and simply use a stop that sits right around some near-term support at $1.84 a share or near that recent low of $1.69 a share. One can also buy CORT off strength once it takes out those breakout levels share with volume and then simply use a stop that sits a comfortable percentage from your entry point. 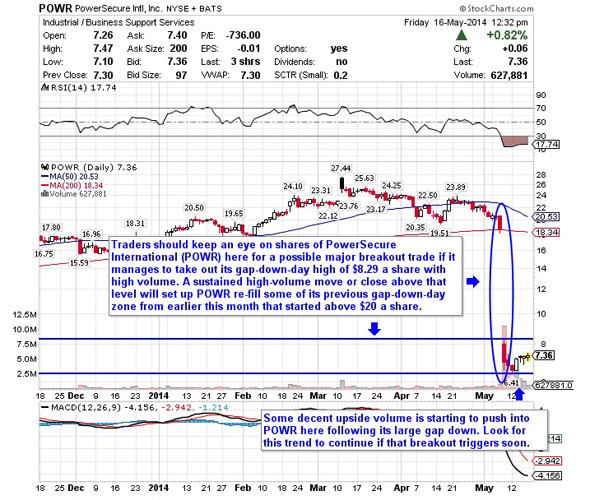 Another industrial player that's starting to move within range of triggering a major breakout trade is PowerSecure International (POWR, which provides products and services to electric utilities and to their commercial, institutional and industrial customers in the U.S. This stock has been annihilated by the sellers so far in 2014, with shares down big by 57%. If you look at the chart for PowerSecure International, you'll see that this stock recently gapped down huge from over $20 to under $7 a share with monster downside volume. Following that gap down, shares of POWR hit a new 52-week low of $6.41 a share. Shares of POWR have now started to rebound higher off that $6.41 low and it's beginning to move within range of triggering a major breakout trade that could push shares of POWR back into its gap-down-day zone. Shares of POWR are also seeing strong upside volume flows today as it continues to come off those recent lows, with over 1.31 million shares traded vs. its three-month average volume of 631,821 shares. Traders should now look for long-biased trades in POWR if it manages to break out above its gap-down-day high of $8.29 a share with high volume. Look for a sustained move or close above that level with volume that registers near or above its three-month average volume of 631,821 shares. If that breakout kicks off soon, then POWR will set up re-fill some of its previous gap-down-day zone from earlier this month that started above $20 a share. Traders can look to buy POWR off weakness to anticipate that breakout and simply use a stop that sits right below some near-term support at $7 or around its 52-week low of $6.41 a share. One can also buy POWR off strength once it starts to take out those breakout levels with volume and then simply use a stop that sits a comfortable percentage from your entry point. My final breakout trading prospect is headphone player Skullcandy (SKUL, which designs, markets and distributes performance audio and gaming headphones, earbuds, speakers, apparel and other accessories under the Skullcandy, Astro Gaming and 2XL by Skullcandy brands in the U.S. and internationally. This stock has been in play with the bulls over the last six months, with shares up 22%. If you look at the chart for Skullcandy, you'll see that this stock has pulled back sharply over the last two months and change, with shares trending lower from its high of $11.40 to its recent low of $6.72 a share. During that downtrend, shares of SKUL have been making mostly lower highs and lower lows, which is bearish technical price action. That said, shares of SKUL have now started to rebound off that $6.72 low and it's bouncing higher today off its 200-day moving average of $6.95 a share. That bounce is starting to push shares of SKUL within range of triggering near-term breakout trade above some key overhead resistance. Traders should now look for long-biased trades in SKUL if it manages to break out above some near-term overhead resistance at $7.58 a share with high volume. Look for a sustained move or close above that level with volume that registers near or above its three-month average action of 765,271 shares. 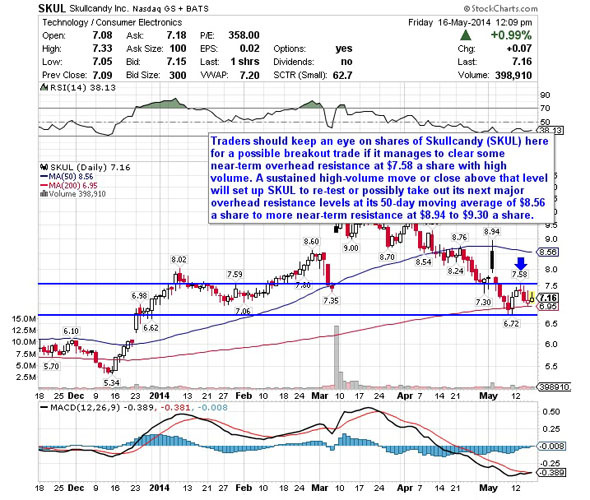 If that breakout triggers soon, then SKUL will set up to re-test or possibly take out its next major overhead resistance levels at its 50-day moving average of $8.56 a share to more near-term resistance at $8.94 to $9.30 a share. Traders can look to buy SKUL off weakness to anticipate that breakout and simply use a stop that sits right below its 200-day at $6.95 or near that recent low of $6.72 a share. One can also buy SKUL off strength once it starts to take out $7.58 a share with volume and then simply use a stop that sits a conformable percentage from your entry point.